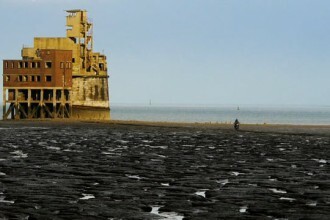 ‘Ain’t Got No Fear’ (2016) is a project which Mikhail Karikis created with a group of teenagers who are growing up in the militarised post-industrial marshland of the Isle of Grain in Kent. The project comprises a single-channel video installation, a photographic series and a two-channel video-screen installation. In response to the isolation of their village and the lack of space for teenagers, in the last few years, kids have been organising raves in a local wood, recently raided by the police. Using as their beat the persistent crushing noises of the demolition of a neighbouring power plant, 11 to 13-year-old boys from Grain sing a rap song they wrote about their lives, recalling memories of being younger and imagining their old age and future. Reminiscent of a music video the central film glimpses teenage experiences on the edges of urbanity by following youths to their secret underground hideaways and capturing their rackety reclaiming of the local site where raves used to take place. 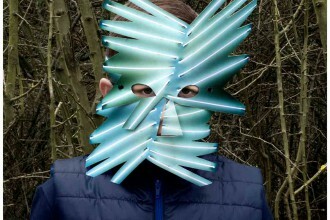 A photographic series depicting a group of children in rave-inspired and demon-like masks is a playful and critical response to the kids’ feelings of demonisation by adults. 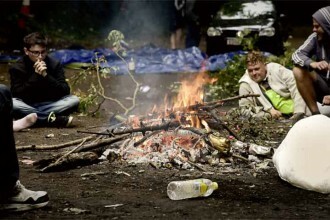 A two-channel video shows older teenagers in a hidden wood in the early hours, returning to the rave site with a car blasting drum n’ bass music and gathering around the fire to sleep, dance and socialise. The project reveals a way in which industrial sites are often re-imagined by youths with a form of spatial justice defined by friendship and play, the thrill of subverting authority and evading adult surveillance.